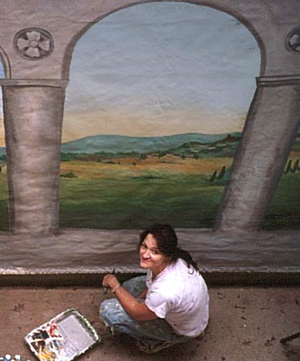 It’s hard to believe it’s been 10 years since I painted my first mural! I remember how it took me FOREVER to paint a fairly small 5 x 11 foot wall space. But a big thanks to my dear friend Barbara for launching me on my career path! I’m sure her son has well outgrown the nursery I painted for him but hey, I’d like to think the room helped inspire and mold him into the creative intelligent youngster that he’s become. Since then, I’ve painted DOZENS of nurseries and kids rooms as well as some more unexpected things: like a garage door, a church sanctuary and a 160-square foot canvas dance floor for a Simpsons-themed bar mitzvah. I’ve had some wonderful experiences over the past decade – and some were just plain funny. Like the time I was locked out of a house and stranded on the second story balcony! I literally had to lasso a nearby ladder and climb down. Or the time I was called into a “mural emergency” when a woman’s do-it-yourself project went awry and was left with what looked like a big dark blue hole in her ceiling. I fondly remember the lovely Indian woman who fed me the most unbelievable dishes every day and the new mother who cried the first time she saw her baby’s room. I think what makes this job so great is that awesome feeling of when you’re a part of something big. A couples first- or fifth!- baby. A new home. A well-deserved splurge. Opening a new business. I’ve been a part of some really incredible moments in people’s lives, and for that I’m thankful and humbled. It’s been a great journey thus far. I can’t wait to see what the next 10 years has in store!